Heinemann). 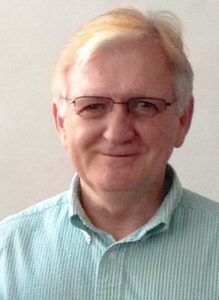 He is also the author of a book-length poem, The Grand Unified Theory, which examines connections between science and faith. Between 1985 and 1992, he published a literary journal, sponsored contests, and conducted poetry events in Washington, DC, and Alexandria, Virginia. There, he also served as a member of the Folgers Poetry Committee for the Greater Washington, DC, Area. He is the former Division Director of NASA Ames Research Center’s publishing, video, photography, and graphics department. As a writer for the Teacher-in-Space program, he has created educational science for students and educators, producing titles such as Spacesuit; How We Get Pictures from Space; Sentinels in the Sky; and Threshold of Space, and a Golden Book Space Machines (for Western Publishing). I’m in Bob Haynes’ workshop and I just want to tell you how much I like and admire him. His lessons are so comprehensive, as are his careful critiques. You can tell he really puts a lot into it and that he loves the art and craft of poetry. I’m so glad I took this class, just to meet him. An open-forum poetry workshop in which students’ interests will direct the nature and content of our discussions.